After the Yealm trip, the crew went home and I spent the night on the boat – bacon, two eggs, beans followed by half a tin of pineapple chunks, then tea and chocolate, a Raymond Carver collection of short stories and the weather forecast – bliss. Except the weather forecast was bleak – southerly winds, (force 7 was mentioned), rain, poor visibility. The rain arrived in the middle of the night, beating an uneven tattoo on the deck, while the wind flogged a loose halyard against the mast of an unidentified boat nearby. And in the morning? Well, what do you do? Stay in your bunk bemoaning the bad luck that brought inclement weather on the one weekend you had to spare for the boat – or do you do something? OK. Going to sea in a 25 foot boat in poor visibility with the possibility of force 7 onshore winds is not sensible. How about gaining some experience with a motor/sail inside the Sound and up the Tamar to the Lynher River and back? Not particularly sensible either. The challenge here would be heavy, possibly gusting winds opposing an ebbing spring tide – one of the highest of the year, meaning strong currents, broken water and short steep waves. In our first year with Blue Mistress, we had a swing mooring on the Tamar – on the Cornwall side of the river at Torpoint. I am more than aware of the effect of wind over tide here, and the way the wind can funnel up the river. On the other hand, this a boat designed with such conditions in mind. And, if nothing else, it would be a chance to see whether my new flotation suit is waterproof! The sail from the Plym to the Tamar is brisk – foresail only. The Sound is lumpy, the outgoing tide from two rivers meeting somewhere along the way and the wind blowing hard from the south. Dinghies are flying to and fro to the east of Drake’s Island preparing to race. RIBS full of stewards flitter everywhere. The current flowing through the Narrows slow us to 1 knot – engine and sail. Sheltered from the full effect of the wind, the water is smooth here, but as we turn north into the wider expanse of the Tamar, the waves become more urgent. By now, there are three of us yachts running with the wind, occasionally surfing, but comfortably settled to the task, helmsmen concentrating. The car ferries are still running. 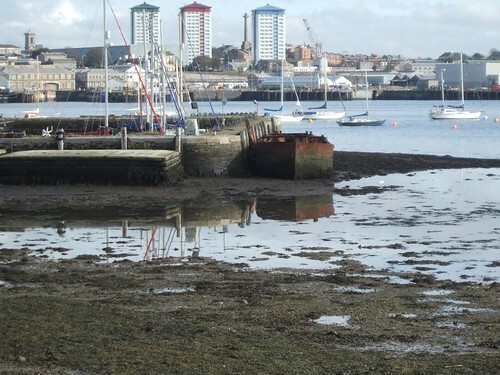 I commit to going astern of one ferry just leaving the Torpoint shore and have to alter course more than expected passing in close to the fixed moorings – carefully avoiding the ferry’s chain. We meet one of two fishing boats, powering into the waves, throwing water aside. Towards the entrance to the Lynher, my companions keep straight on towards Saltash while I veer slightly to port looking for the red canister buoy that marks the entrance to the channel. Here there are Royal Naval moorings, with various barges attached. At his point I am passed in very quick succession by four large RIBs each carrying perhaps a dozen or so helmeted young sailors making for HMS Raleigh. I get a few side-lnog glances but in the main each man clutches firmly the back of the seat in front, looking determinedly forward in the, by now, heavy rain. They must be looking forward to hot drinks and dry clothes a few minutes ahead. As they disappea down the line of bargees a naval launch scuttled past, an officer leaning nonchalantly against the cabin top. They show the way to the buoy and disappeared up river. So, rounding the buoy into the Lynher, we (boat and I) are faced with a strong head wind, a strong out-flowing tide and smoother water. Although we can manage the stretch to the next buoy close-hauled, the sail will have to come down. There follows a few minutes scramble as I point the boat into the wind, slight throttle on the engine to give some direction – (but wind and current too strong to keep that direction for long), let go the jib halyard, rush forward to catch the sail before it drops in the water, hurriedly make it fast to the lifelines, back to the tiller to bring her back into the wind – which requires more throttle than expected, forward again to tidy loose ends, and back to regain control. Thank goodness for the low cabin top and free movement forward on the Folksong. I motor slowly past HMS Raleigh and turn across the wind towards Antony Passage, making the red canister buoy. At this stage, the prospect of an even slower plod straight into the full force of wind and current loses its thrill and I decided to turn for home. A large (40 foot?) yacht is running downwind and passes me at speed, three older gentlemen on board, blue ensign flying. I follow her, travelling fast now with wind and tide. under engine only, knowing that all would change when we reach the Tamar again. An even larger ketch motors across in front of us, seemingly heading for a quieter mooring in the lee on the North Wilcove side. A white, wooden Folkboat motors upriver towards Saltash, towing a small pram dinghy. The yacht ahead, heeled abruptly taking the full force of the wind and headed close-hauled to the Devon side on the river. I keep close in the slight lee on the Cornish side until there is no choice but to face the wind. It would be possible to write an exciting adventure story around this – how we overcome wind, waves and repeated danger to triumph in the end. But the point is that the boat is up to the trip. All that is required of me is to make directional decisions – keep to a sensible course and speed and avoid taking a wave over the side. We enter the main part of the river through two standing waves. They are quite steep and close together – or seemed to be as there isn’t time to think about them. Blue Mistress lifts to the first one and comes down onto the second one, slicing into it, throwing water aside – the long keel keeping a firm grip. Very little comes on deck, despite the low freeboard. This seems to be the pattern – spray will blow aboard, but green water very rarely. (As EB says, she was designed to take this). The wind is strong and steady, throwing up plenty of wind-blown spray. This is the first time I have ever had to abandon my glasses – too salty of see through, too much rain and too much concentration on steering to clean them. This length of the river is a little over two nautical miles long with a width varying between a quarter and a third nautical mile. Apart from the car ferries and the police patrol launches, there is no one ahead of me. The yacht that has been ahead is now behind and a little later she disappears into the Torpoint shore. The prospect is bleak – empty wharves, dockside buildings, moored yachts appearing and disappearing in the incessant rain. At the end of the straight a much larger boat suddenly appears round the corner heading upriver and we get a friendly wave – then I saw him look upstream and then back across at Blue Mistress and give a thumbs-up. Actually, that’s what I thought, too. The rest is straightforward. The current down to the entrance to the Narrows is still strong, but the water smooth. I cut the engine, set the foresail and we shoot back to the Plym, passing the Brittany Ferries’ ‘Pont Aven’ manoeuvring stern first into her berth. At the entrance to Sutton Harbour, a large white yacht appears, pauses while a conversation is held in the cockpit, turns and disappears back into the marina. I lower the foresail off the Cattewater wharves and motor back to the mooring, picking up the trot rope easily in the now slackening tide. The time is 1430. Leaving the soaking sails on deck, the rest of the day is spent with Raymond Carver below – and the rain keeps falling!